MOGADISHU, Somalia -- An explosion that blew a hole in a jetliner shortly after takeoff and left one man missing was believed to have been caused by a bomb, the pilot said Wednesday, describing how the crew calmed frightened passengers as smoke enveloped the cabin before he brought the plane back to Mogadishu's airport for an emergency landing. Residents of Balad, a town 30 kilometers (about 18 miles) north of Mogadishu, found the body of a man who might have been blown out of the Airbus 321 in Tuesday's blast, said police officer Mohamed Hassan. Abdiwahid Omar, the director of Somalia's civil aviation authority, told state-run Radio Mogadishu that authorities were not sure if the body was the missing passenger. This video was taken by Awale Kullane, a Somali diplomat on board. Government officials also said no evidence had been found so far of a criminal act. Mohammed Ibrahim Yassin, CEO of Daallo Airlines, did not rule out that a bomb planted on the aircraft was responsible. "At this stage, everything is possible. We cannot rule out anything at this stage," Yassin told The Associated Press. No group claimed responsibility for the blast. Somalia faces an insurgency from the Islamic extremist group al-Shabab, which has carried out many deadly attacks across the nation. Capt. Vlatko Vodopivec, the pilot, said he and others were told the explosion was caused by a bomb. "It was my first bomb; I hope it will be the last," Vodopivec told the AP by phone from Mogadishu. He said the blast happened when the plane was at around 11,000 feet (3,350 meters) and still climbing to its cruising altitude of 30,000 feet. "It would have been much worse if we were higher," he added. Had the blast occurred at a higher altitude, it could have led to explosive decompression on the plane, which might have caused more severe structural damage, and would have forced a more rapid descent because of limited supplies of oxygen to the passengers. 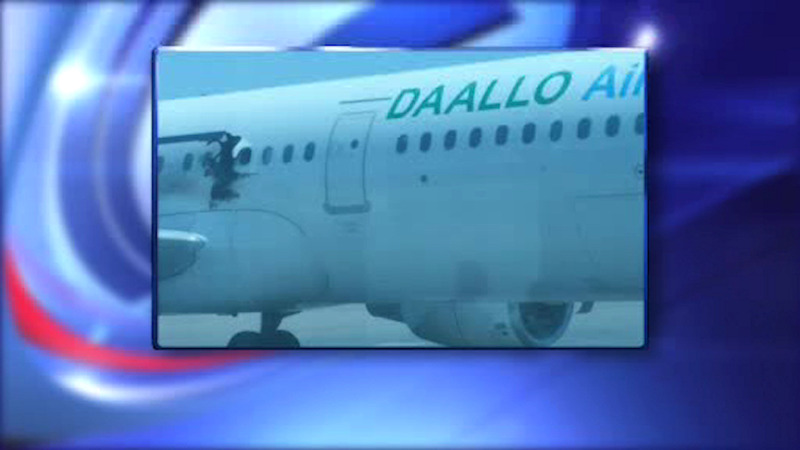 Daallo Airlines said all passengers except one got off the plane safely. It previously said the plane, which was headed to Djibouti in the Horn of Africa, carried 74 passengers. Yassin acknowledged that signs pointed to the possibility a passenger was sucked from the plane at the time of the blast. "Maybe one person fell out of the hole. But nothing is sure," he said from Dubai, United Arab Emirates, where the airline has its commercial offices. Cellphone video taken during the flight showed passengers, some wearing oxygen masks, sitting toward the back of the jet, with empty seats in the front of the cabin near the hole in the fuselage. A loud sound of rushing air could be heard on the video, which was shot by Awale Kullane, Somalia's deputy ambassador to the United Nations. The passengers bunched in the back appeared calm. A child wearing an oxygen mask sat quietly, partially covered by a blanket. Near the hole, oxygen masks dangled and swayed from overhead compartments. "When we heard a loud bang, the co-pilot went back to the cabin to inspect the damage, and I took over the commands as the procedure demands," the Serbian pilot told AP, adding that the engines and hydraulics functioned normally so he had no problem flying the aircraft back to Mogadishu. "Smoke came into the cockpit, but it was mostly concentrated in the back of the aircraft," he said by phone. "The stewardesses did a great job calming down the passengers and following the emergency procedure." The flight crew included an Italian co-pilot, with two flight attendants from Greece, two from Kenya and one from Bosnia, he said. Kullane said in a social media post that he "heard a loud noise and couldn't see anything but smoke for a few seconds." When visibility returned, he realized "a chunk" of the plane was missing. "I think for the first few seconds and minutes ... I was terrified and most people were terrified," he said. "Of course, we give credit to the pilot who landed that plane." Daallo Airlines said in a statement posted on Facebook that the Airbus A321 was operated by Hermes Airlines, based in Athens, Greece. Hermes' main business is leasing planes to other carriers that are staffed and serviced by its crew to other carriers. Its fleet includes four A321s, one Airbus A320 and one Boeing 737, according to its website. Investigators from Somalia and Greece are conducting the inquiry, Yassin said. Daallo will continue to operate while the investigation is carried out, he added. On Dec. 11, 1994, a bomb on a Philippine Airlines jet with 293 people aboard blew a 2-foot (0.61-meter) hole in the floor leading to the cargo hold, but the pilot was able to make a safe emergency landing. One passenger was killed and 10 others were injured on the Manila-to-Japan flight. The plane was flying at about 33,000 feet (10,058 meters) when the blast occurred, and it landed about an hour later on Okinawa in southern Japan. Ramzi Yousef, who was sentenced to life in prison for the 1993 bombing of the World Trade Center in New York, was convicted in the bombing of the Philippine Airlines flight.